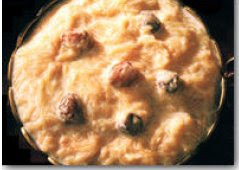 Sevai Payasam(Kheer) or semiya payasam is popular among tamilans. Its made up to vercimelli which is also called semiya or sevai in tamil. Hence it derives this name from that word. Its tempting and aromatic and would make anyone carve for more. Place the milk in a heavy saucepan and, stirring constantly, bring to a boil. Keep stirring and simmer until the milk is reduced to three-quaters its original quantity. Do not remove from heat. In the meantime, heat the ghee in a heavy frying pan or skilet. Saute the cashewnuts and raisins for 2-3 minutes. Remove and set aside. In the same ghee, saute the vercimelli until it turns reddish in colour. Add to the reduced milk, which should be still boiling. Continue cooking till the vercimelli is well done. Lastly add the sugar, crushed cardamoms and saffron. Stir thoroughly. Garnish with sauted cashewnuts and raisins. Note: Dont fry the vercimelli too much, fry only till its reddish. keep stirring the payasam , since its chances to avoid lumps of vercimelli.